With great sadness, we report the loss of our colleague Scott Fairman. Please read on to learn how Scott helped to end homelessness in Mercer County. Scott received a BS in Business Administration from Pennsylvania State University. He went on to receive an MBA from LaSalle University. Later in life he attended Mercer County Community College and earned a Paralegal Certificate. For many years, Scott worked in field of the Real Estate as a Senior Real Estate Analyst, Real Estate Loan Officer, Senior Review Appraiser, and Senior Underwriter. Somewhere along his life path, Scott lost his way. Holding an MBA in Finance didn’t spare Scott from hitting rock bottom. Nearly a decade ago, while living in a homeless shelter, he made a momentous decision to take his life back. Scott turned to Catholic Charities for a helping hand. “I got counseling, support and education at Partners in Recovery, a program geared to individuals with a dual diagnosis,” said Scott during a videotaped interview in 2010. After “graduating” from Partners in Recovery, Scott returned to school and earned a certificate, with honors, as a paralegal. He worked with the New Jersey Advocacy Network to End Homelessness attending events, congressional visits and speaking to the press about the issues of homelessness and recovery. Scott Fairman was a member of the Catholic Charities’ consumer advocacy network since 2008 and Client Achievement Award recipient at the Guardian Angel Dinner Dance in 2009. Scott served on the board of Trustees of Central Jersey Legal Services, and on Governor Corzine’s Interagency Council on Preventing and Reducing Homelessness. 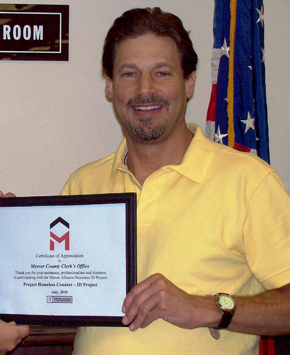 Last month, Scott was selected to serve on the Mercer County Homeless Trust Fund Board. Scott Fairman worked for four years at Mercer Alliance to End Homelessness, continuing to advocate for individuals experiencing homelessness. For three years, he served as a VISTA (Volunteer-In-Service-To-America) researching and developing programs to assist individuals experiencing homelessness. Scott studied employment strategies and created a white paper. Scott researched ID issues and created the Mercer Alliance Homeless ID project with assistance from the Mercer County Superintendent of Elections; City of Trenton, Office of Vital Statistics; Mercer County Clerk’s Office; New Jersey Department of Vital Statistics; Greater Trenton Behavioral Health Care; Salvation Army Drop-in Center; Rescue Mission of Trenton; Trenton Area Soup Kitchen; and two volunteers. Over 200 individuals have been assisted in obtaining a photo ID which allows them better function in the process of recovery. He researched homeless courts, resulting in a pilot project in Trenton, the Fresh Opportunity Program that was created for those with outstanding municipal warrants in conjunction with Pat Budd, of Central Jersey Legal Service, Trenton Courts, Catholic Charities, Greater Trenton Behavioral Healthcare and volunteer attorneys from Mercer County. As a paralegal, Scott volunteered at Central Jersey Legal Services assisting a volunteer attorney at the Community Reconnect Center, to aid people returning from incarceration. Scott was a wonderful four year IRS-certified Tax volunteer for the Mercer CASH (Creating Assets, Savings & Hope) campaign by doing free tax preparation at the Boys & Girls Club, United Financial Empowerment Center and many of our Super Tax events. Most recently, Scott served on the Community Health Improvement Plan for Greater Mercer County and provided input on ways to improve accessibility to primary healthcare and transportation within the county for mental health consumers. Scott had been volunteering at Central Jersey Legal Service, Inc. assisting the housing attorney. Scott helped the cause to end homelessness by working on a special project to screen individuals for SSI/SSDI as part of the SOAR project. He overcame many obstacles to regain control over his life and wasted no time in offering a helping hand to others. In the end, Scott found his way. Scott will be sorely missed but leaves a legacy of kindness that lives on with everyone he met. Mercer Alliance to End Homelessness’ ID Project will be renamed The Scott Fairman ID Project for individuals experiencing homelessness. To find out for about IDs or to Donate in Scott’s honor to ID project press this link.. Please join us at the Mercer County Homeless Memorial Service, on Thursday, December 20th 10am, at Turning Point United Methodist Church, 15 S. Broad Street, Trenton, NJ. Parking is in the garage behind the Church. We will have a special remembrance of Scott Fairman.